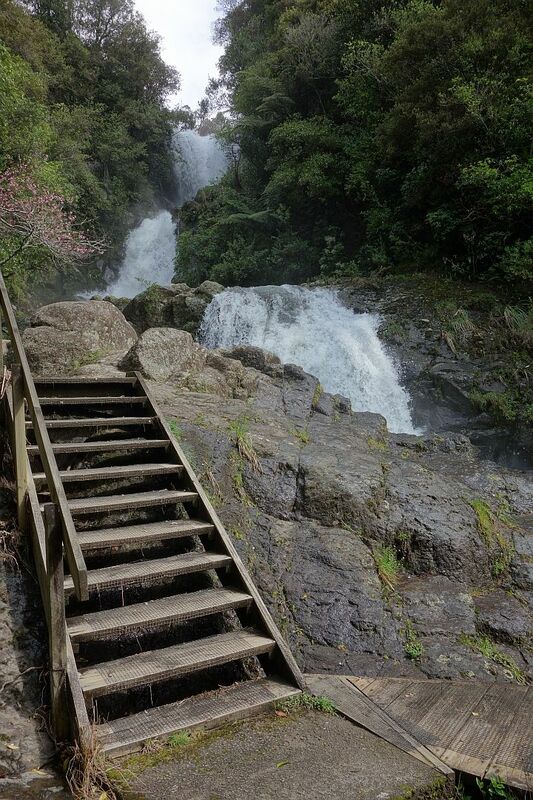 Kaiate Falls Scenic Reserve, Te Rerekawau, is only a short distance from Tauranga, accessible from Kaiate Falls Rd. 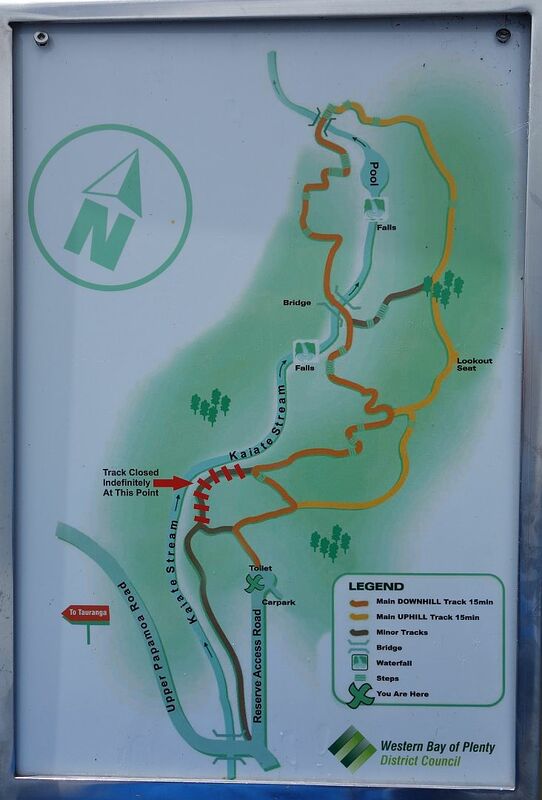 There is a parking area, toilet, and a track map on a short, narrow access road by the bridge over the Waitao Stream. The tracks are well formed, with steps in the steepest places. There may be mud on the tracks, and the rocks can be slippery when wet. There is a height difference of about 75m between the parking area and the lowest point of the track which follows the stream. 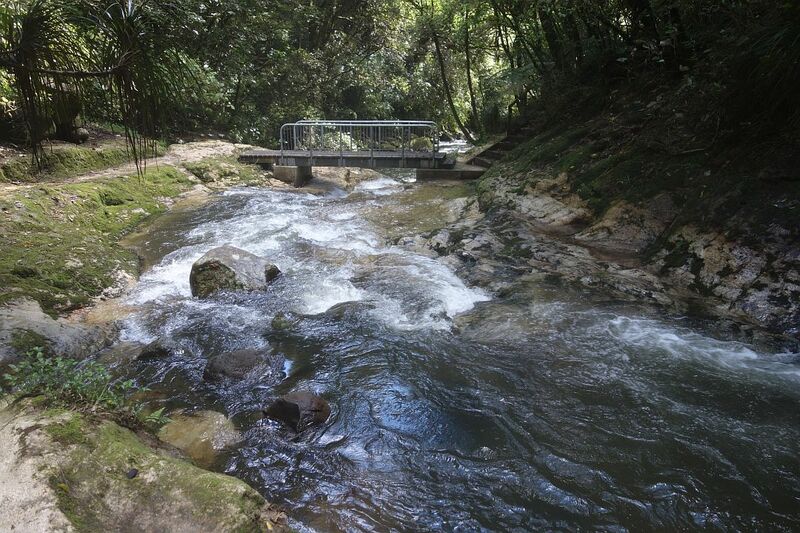 The amount of water in the Waitao Stream varies considerably depending on rainfall. Most of the photos here were taken after two days with about 85mm of rain. During heavy rain the bridges may be under water, as had happened recently. 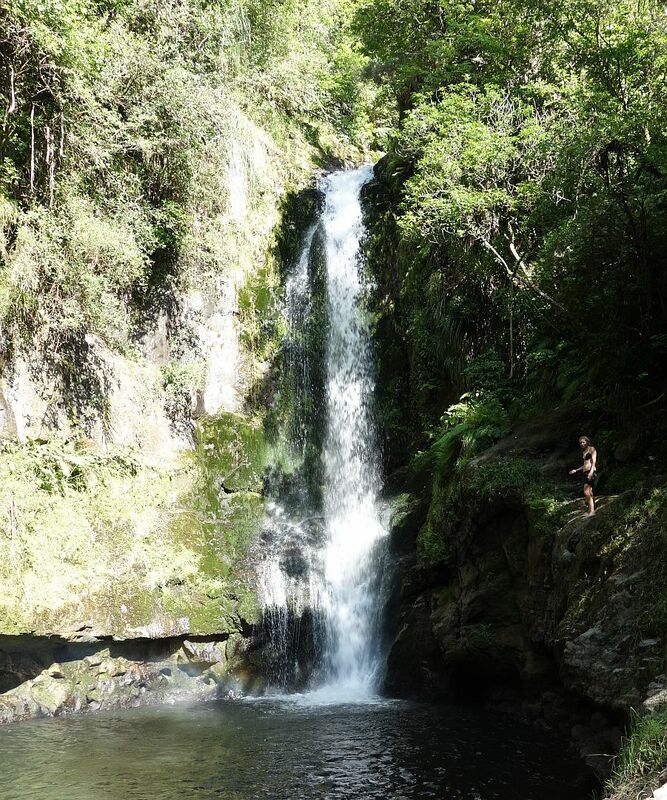 During the summer months the scenic reserve is very popular, as there are a number of swimming holes, some with the possibility of dives from several meters height. There are about 2km of track, and it took about 45 minutes for the walk, including plenty of breaks along the way. 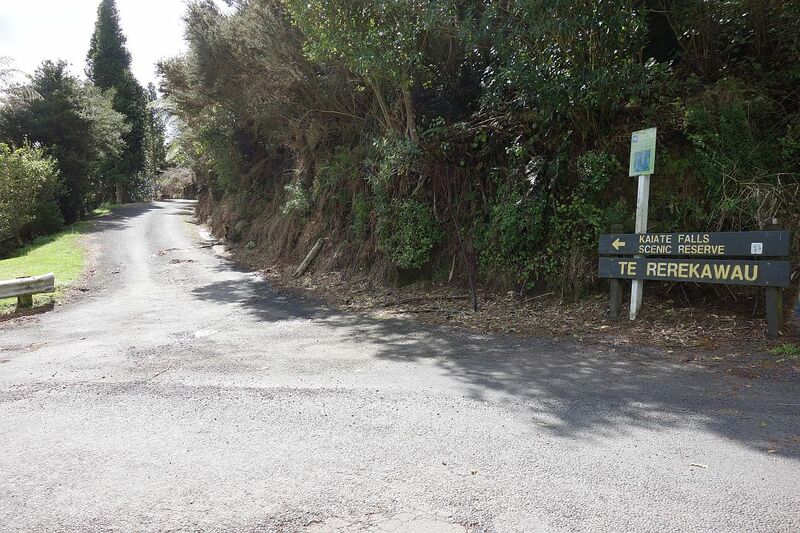 The access road to Kaiate Falls Scenic Reserve – Te Rerekawau. The layout of the tracks in the reserve. Similar maps are installed at various locations on the tracks. 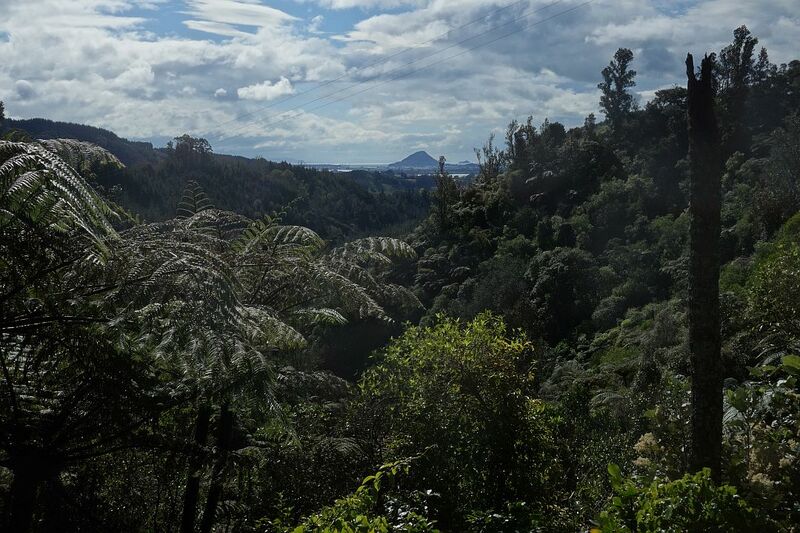 Mt Maunganui – Mauao is clearly visible from the track near the carpark. 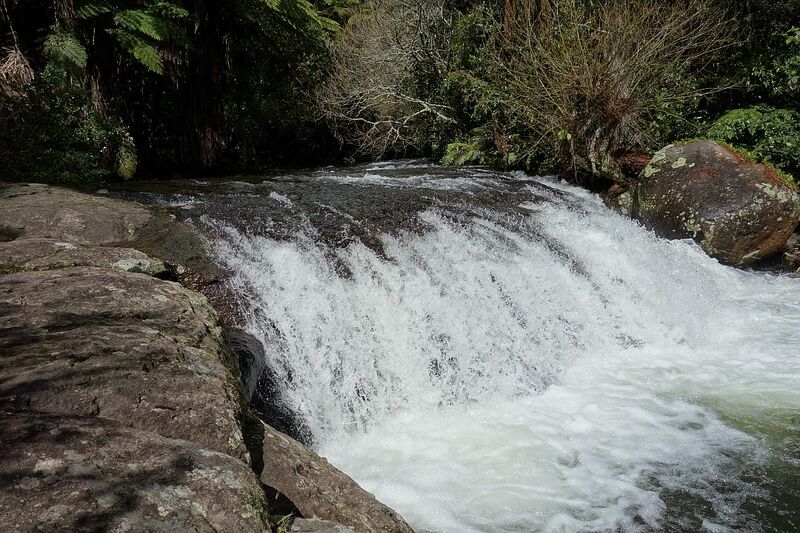 There are numerous small falls or rapids along the stream, especially after recent rain. The upper falls consist of 3 smaller falls. 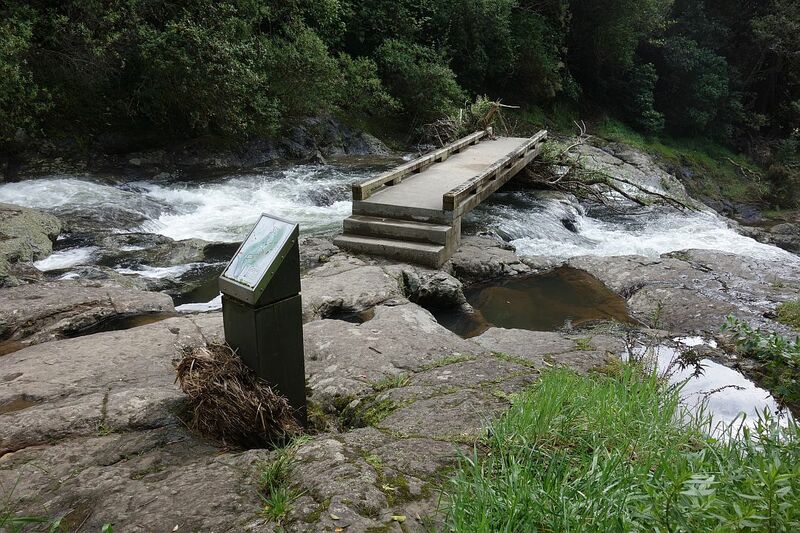 This bridge has been under water within the last day or two, and the water has been as high as the pedestal with the map in the foreground. Several trees had fallen near some of the tracks, and one of them had lodged under the bridge. Part of the stream still crossed over the rocks on the other side of the bridge, and it was flowing fast, so care needed to be taken. 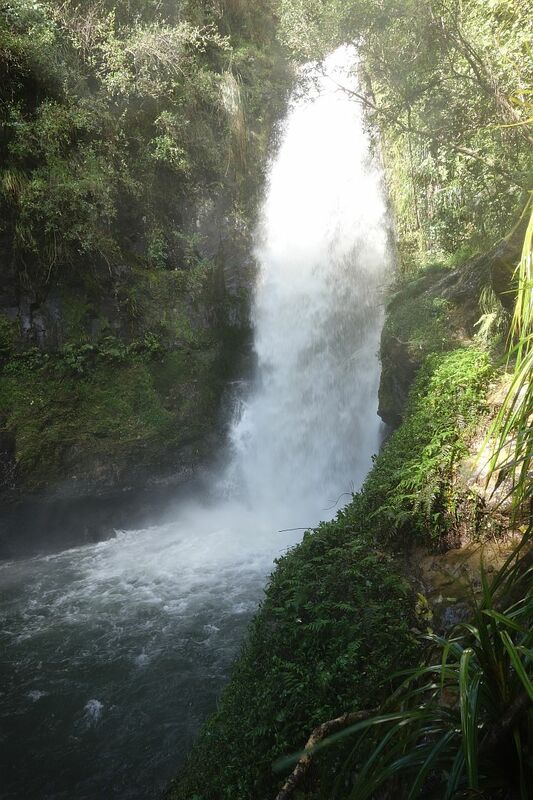 The lower falls consist of one single fall, with a deep pool below it. It was windy, and the spray was making photography rather difficult. The pool at the base of the falls is a popular swimming hole during the summer months. 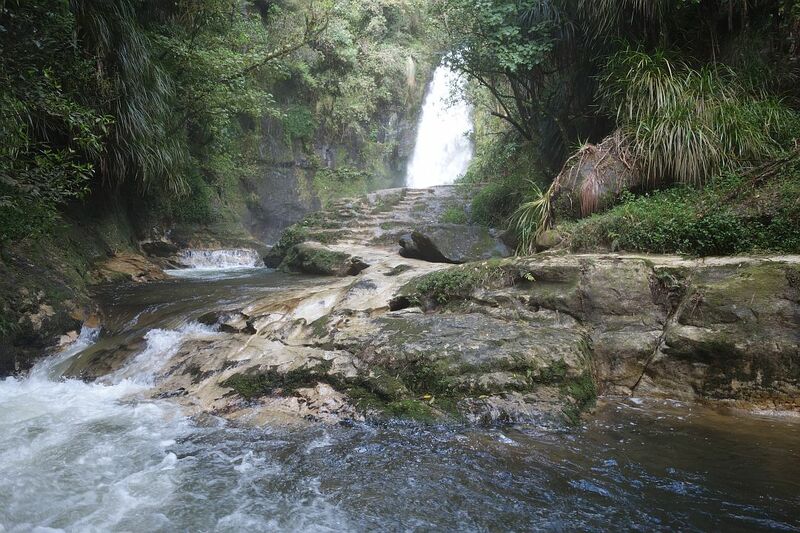 This photo was taken in January 2013, with one swimmer ready to jump into the water from the bank on the right. The stream had less water flowing at that time. The walkway on the lower bridge had also been under water during the heavy rainfall. At other times the rails on the bridge have been completely covered with vegetation, showing that the whole bridge had been under water. The track was walked on September 14, 2014, as well as numerous other times. 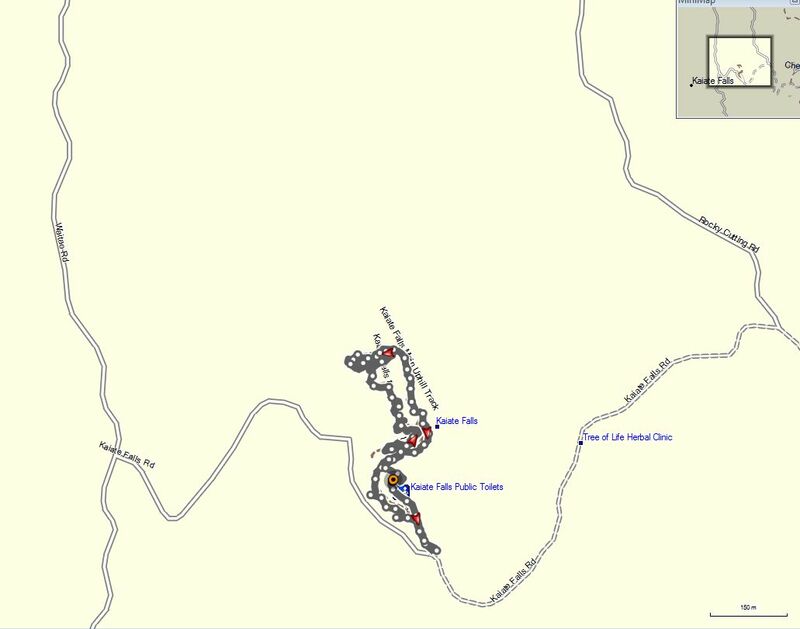 Here is a GPS log, which is not too accurate, due to vegetation and the deep valley. 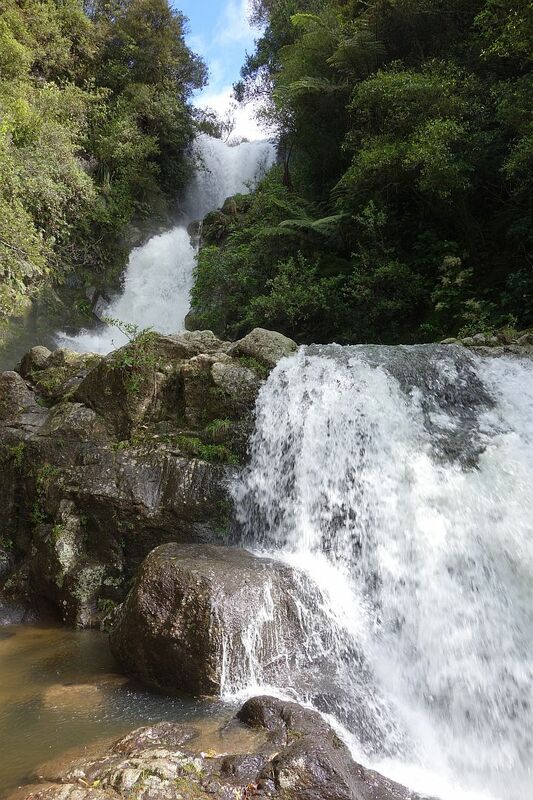 This entry was posted in Walks and tagged Kaiate Falls, Tauranga, Te Rerekawau, Waitao Stream on 2014-09-14 by nzartig.